As more green beauty brands make their way onto the market, I’ve become a bit more discerning about what makes it onto my repurchase and recommend lists. To stand out to me in a crowded clean beauty market, brands must focus on offering well-edited, smartly formulated and designed collections that rely on the strength of the ingredients they source. Simply put: They must work, and they must fit my aesthetic. I’ve found that in MUN Skincare, which is one of my go-to lines offered at Integrity Botanicals, a favorite online green beauty retailer. Today, I’m excited to partner with Integrity Botanicals and MUN to offer TWO lucky readers an opportunity to experience MUN’s No. 1 Aknari Brightening Youth Serum and No. 11 Anarose Rejuvenating Rose Toner. I bought this gorgeous oil from MUN’s founder Munemi Imai herself at the 2014 “A Night for Green Beauty” event in LA, and it remains one of my favorite facial oils to date. Made with three fantastic oils, MUN No.1 Aknari Brightening Youth Serum captures the best of green beauty in one beautiful, violet pump bottle. It combines Ecocert-certified prickly pear oil, argan oil and rose oil in a blend you’ve never seen — or smelled — before. I know it sounds simple, yet its elegance is unparalleled. Even the most discerning green beauty connoisseur falls in love with this facial oil. Hands down one of my favorite gentle exfoliating toners, MUN’s Anarose Toner brings together new rose blossoms hand-harvested from the Valley of Roses in Bulgaria with MUN’s signature prickly pear extract, hyaluronic acid and essences of jasmine and daisy. Talk about a floral finish! This toner is designed to soften, smooth and protect against the elements, especially when used alongside the No. 1 Aknari Serum. The pour-top makes it easy to use on a cotton round, but it also comes with a spray top attachment for those of you who enjoy misting your face before patting in your oils and serums. I’ll share a full review of this toner soon, but know this: I’ve gone through two bottles of this stellar toner, and I have no intention of ever being without it. It’s got a permanent spot in my top shelf of toners. Want to see how MUN looks on your top shelf and feels on your skin? 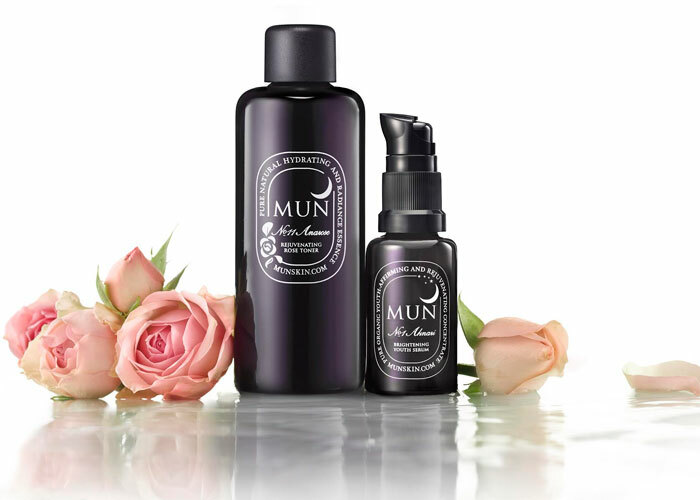 TWO lucky readers will win both the serum and toner (aka the entire MUN collection!). Use the Rafflecopter widget below to enter (SO MANY ways to get multiple entries thanks to Integrity Botanicals and MUN). Good luck! Giveaway begins Friday, June 19, 2015, at 12:00 a.m. Central Time, and closes on Friday, June 26, 2015, at 12:00 a.m. Central Time. 3. Giveaway begins Friday, June 19, 2015, at 12:00 a.m. Central Time, and closes on Friday, June 26, 2015, at 12:00 a.m. Central Time.